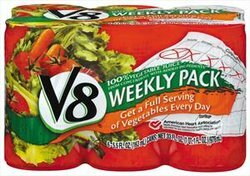 V8 Vegetable Juice 6 - pack (5.5 oz Cans). Made with 100% vegetable juice, you can now get a full serving of vegetables in just one can of V8. Each package contains six 5.5 oz cans of V-8. Each can is only 30 Calories.